Web News System: Yvonne Craig as Batgirl tries on the suit. Yvonne Craig as Batgirl tries on the suit. 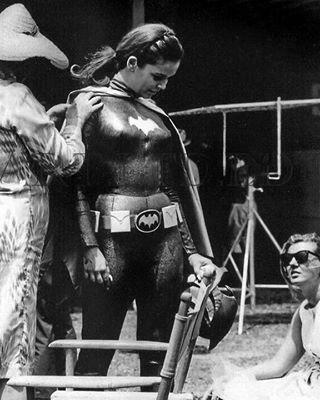 It's the 1960s, and Yvonne Craig is being dressed for her role as Batgirl for the campy ABC TV show, Batman. Though you can't tell from this photo, Batgirl wore a purple and yellow outfit. It gets better, she also rode around on a purple motorcycle - just like Prince did. How cool is that? Craig has been called a pioneer of female superheroes for television. She also appeared on Star Trek as the green-skinned Orion slave girl Marta in the episode "Whom Gods Destroy." I haven't seen the episode, but I assume she gets busy with Capt Kirk.